Islanders of Niue don't have many public holidays during the year. One of the few public holidays is Constitution Day, that is celebrated on October 19. Niue is an island country in the South Pacific Ocean. This is a self-governing state in free association with New Zealand, and the latter is responsible for most of its diplomatic relations. Although New Zealand is representative of Niue on the international arena, Niue has its own constitution, that was adopted in 1974. 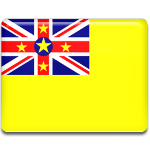 Following the 1974 referendum New Zealand granted Niue self-government and Constitutional Act, which is the supreme law in the country. This event took place on October 19, that later became a public holiday. Various events are organized to celebrate Constitution Day. The official ceremony begins early in the morning, when the New Zealand and Niuean flags are raised to mark the unique relations between two nations. Prime Minister delivers a solemn speech. The unofficial festive events include canoe racing and fairs. The visitors have an opportunity to try best traditional cuisine.